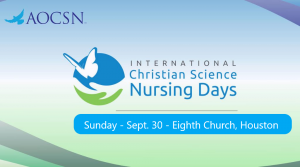 Your Houston Visiting Christian Science Nurse Service is participating in an international outreach event sponsored by the Association of Organizations of Christian Science Nursing (AOCSN). This event will encapsulate the tender, practical care provided by vising Christian Science nurses, as well as encourage those drawn to learn how to pursue a career as a Christian Science nurse. This program will be presented in English and Spanish, concurrently. We look forward to welcoming you in the Sunday School room of Eighth Church of Christ, Scientist, Houston. A light lunch will also be provided. This entry was posted on Saturday, August 18th, 2018	and is filed under News.